DUBAI: The future of Multiple Sclerosis (MS) patients has become more promising, as right attitude and proper medication can help in leading an active and happy life, said MS sufferers and specialists in the country. Patient networking forums and care groups have boosted support for patients with the disease in the Emirates by educating them and helping them avail best treatment options. In celebration of World MS Day, two support groups in Dubai organised such awareness initiatives that were focused on enhancing possibilities for MS patients. MS is one of the world’s most common and complex diseases, which disables nerves in the brain and spinal cord. The auto-immune disease affects the central nervous system by impairing myelin, the protective sheath that covers nerve fibers. When the myelin gets damaged, the nerve cells in the brain and spinal cord fail to communicate with each other, resulting in derailing the connection between the brain’s messaging system and other parts of the body. On Thursday, more than 30 MS sufferers congregated, along with friends and family members, at Wafi City Mall in Dubai to observe World MS Day. The programme was organised by the UAE MS Platform, bringing together MS sufferers in the country. (During the event), the UAE MS Platform launched an interactive online forum, titled UniteMS.net, aimed at encouraging MS patients to register with this website and share their difficulties to seek instructions to conquer the complications. The UniteMS.net forum will help UAE patients get connected with the global platform of MS patients, said the organisers. 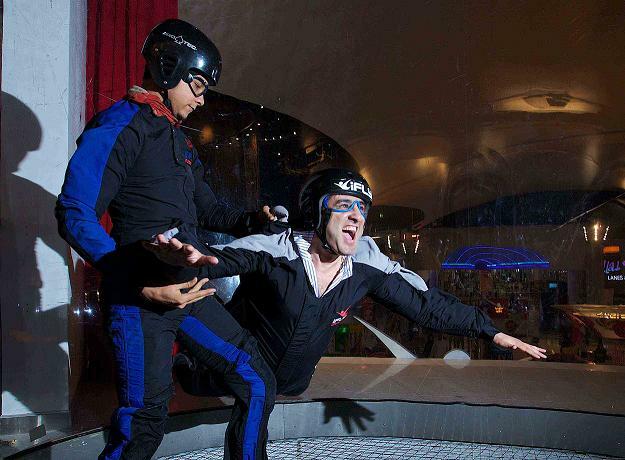 Meanwhile, earlier in the week, ‘Taking life to new heights’ was the theme raised by the UAE MS Support Group, which organised an indoor skydiving programme for its five members at iFly in Mirdif City Centre. The patients took part in the skydiving experience, flying high in the art wind tunnel, to show that chronic disease sufferers can still live life to the fullest if they adopt a positive attitude and their disease is controlled with the correct medications. MS affects patients’ behaviour from walking and talking to eating and even feeling pain and other sensations. Patients suffer from a range of difficulties including motor impairment, balance problems, visual, sensory and cognitive (memory) issues. Dr DM Kayed, specialist neurologist at Open MRI for Spine Surgery Centre in Dubai, explained that MS sufferers can experience a variety of symptoms as the condition develops. “Such patients can experience attacks that may be present with blurred vision, sensory disturbance affecting the face body or limbs, lack of coordination and imbalance, weakness as well as memory and concentration difficulties,” he added. “Injection therapy for MS reduces the frequency of attacks and thus may slow disease progression and help control symptoms. New oral treatments have recently become available; however, clinical experience with these agents remains limited,” pointed out Dr Kayed. UAE MS support group member Dr Budoor Al Shehhi, pointed out, that these patients, however, can continue to take life to new heights despite their illness. “The patients’ celebration [at iFly] was about having the right attitude and the right treatment that will allow them better manage their condition gaining the capability to work, play, and even fly,” she added. Meanwhile, Mohamed Morsi, area therapeutic manager at Merck Serono Middle East, organiser of the MS Platform meet at Wafi Mall, said the objectives of the forum is to identify the patients in the UAE in order to help them enjoy an active and normal life, despite suffering from the chronic disease. “The Middle East MS Platform was launched in the UAE last year to streamline care activities and research programs throughout the region. The forum, an affiliation of several independent MS organisations, key opinion leaders, healthcare groups and commercial corporations, will move us patients closer to a world free of MS,” he added. Sultan, aged 23 years, has been suffering from MS symptoms like poor vision, tremors and fatigue for the past three years. “MS patients can make their life shining and vibrant with proper medication and changes in lifestyle, along with indulging in entertainment and social activities. I have never felt that the disease is spoiling my life,” he elaborated confidently, discussing his survival saga. Another member of the UAE MS Platform Sahar Rahma agreed, saying that the secrets of survival for her, too, are a positive approach towards life, proper course of medication and a healthy lifestyle. “I gained more strength and confidence by communicating with other patients, and joined on the networking platform to share our worries as well as joyous moments. Since I started the medication, the difficulties of the MS in my body have significantly reduced,” she added. Rami, member of the MS Support group who took part in the iFly experience, was diagnosed with MS last year at the age of 32; however, he has not let his illness prevent him from living a normal life, even continuing to travel across the region for work. “Initially when I was diagnosed I was very much in denial. I would tell myself that even though I was diagnosed with MS it would not affect my life at all and nothing would happen to me,” he added. Global statistics show that MS affects approximately 2.5 million people worldwide. Around 25 to 50 people per 100,000 in Arabic populations and about 100 per 100,000 in Northern Europeans also suffer from the disease. MS affects women more than men, and often the symptoms appear between the ages of 20 and 40.